Small Welding Positioners | MBC Made in the U.S.A.
MBC Portable Benchtop Welding Positioner. Used for Welding tubes, pipes and Small Parts. High Quality Small Welding Rotator and Chucks. 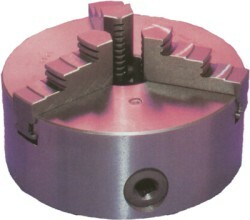 Optional spin lock welding chucks and scroll lathe type chucks. The spin loc chucks mount and center easily on the four slotted turntable face plate. This makes the combination of spin loc chuck and portable table top weld positioner turntable as the best value for sale. These are the best small bench top weld positioner and spin lock chucks made in the USA. MBC spin loc chucks are high quality affordable pipe chucks grippers. High Frequency Filter - For GTAW welding on small parts. Large range in capacity 3/8" to 7"
All steel construction, made in the U.S.A.
Large flexible capacity 0" to 7"
MBC offers a full range of 3 Jaw Scroll welding Chucks, to aid in pipe positioning and holding. Well built durable pipe chucks. These are high quality flat back chucks that can be mounted to any positioner or work bench. All chucks come with mounting bolts, chuck wrench, and reverse jaws to allow you to clamp on the inside or outside of a work piece. When chucks are ordered with a positioner, the positioner is predrilled at the factory. SC-4 4" 2 5/8 1/4 3 1/4 5/8 5 lbs. SC-6 6" 2 1/2 1 1/8 1/4 5 1 5/8 19 lbs. SC-8 8" 3 1 1/8 1/4 7 2 1/8 30 lbs. SC-10 10" 3 3/8 1 3/8 3/8 8 1/2 3 52 lbs.